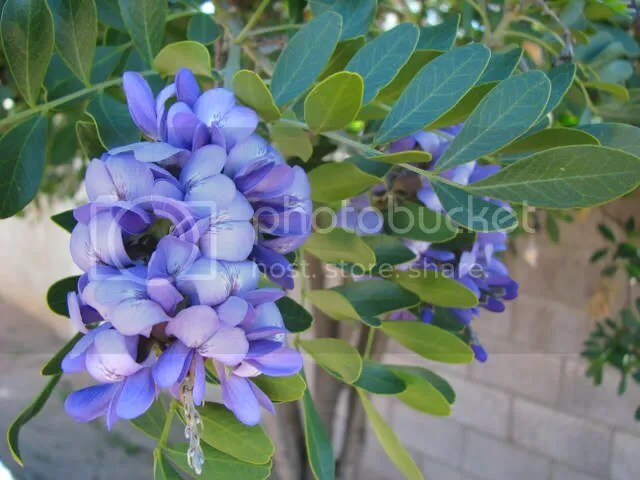 Mescal Bean tree – a purty sight! The front yard features matching ficus trees, that someone, at some point along the line, pruned into perfect little balls. Personally, I’m not into that kind of symetry, and I much prefer a more natural shape, so those are easy enough – simply allow them to flesh out, with judicious pruning, into a more natural and pleasing (and less symetrical) shape. Tree #1 is a fruiting olive, it’s smallish, compactish, and located in a corner of the yard – meaning it doesn’t give shade to anything useful, and its only two purposes seem to be decorating that particular corner and dropping messy fruit on the ground. Tree #2 is an as yet unidentified monster – it’s large and lovely, with a big, beautiful canopy that offers plenty of shade to the center-rear of the yard – which means it’s perfect. Well, perfect except for the fact that it seems to be home to every single bird within a 50-mile radius. Have you any idea how much bird crap can collect under a tree like that? So much for the idea of placing a lounger under there. In two days, the lounger would be rendered unusable by virtue of being covered in poo. Wonder of wonders, that lonely little tree was a Texas Mountain Laurel – AKA Mescal Bean (no relation to the drink, or to peyote, though… it is the “red bean” of Native American lore…) And I think it’s going to stay right where it is – in perfect view of my family room. 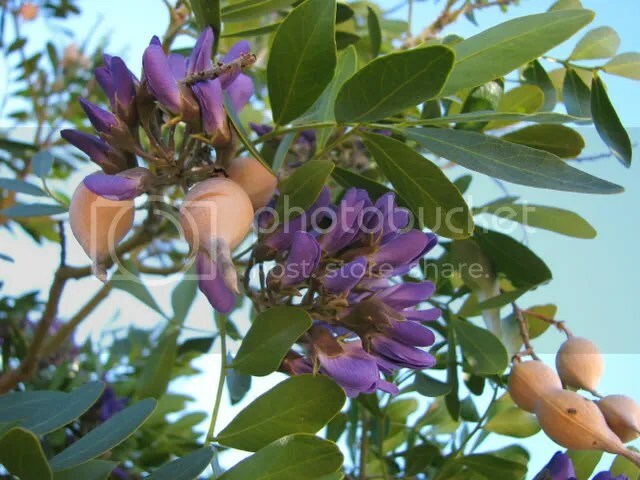 1 reply to Mescal Bean tree – a purty sight!